Created several years ago in Japan, by members of industry researchers in Hokkaido. Carved in the form of shading along the road when we passed on it will eat the strains created wonderful music. This instrument merujpakan idea of mr. Shinoda, one inspired by damage to roads in the area around his home. With a variety of preparation and the help of several parties finally created this wonderful work. The result, the Way Music is etched holes with a width of 6mm and separate each distance of 12 mm which is capable of creating beautiful music buzz. 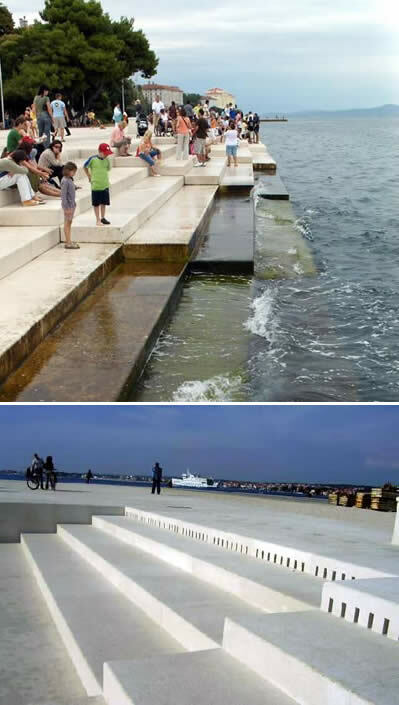 Ocean or organ called morske orgulje is located on the coast of Zadar, Croatia, and is the world's first organ played by ocean waves. Here there were 35 tubes in the form of music that opens a hole on each side. 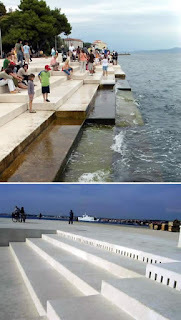 When sea water touching the organ, will create sweet sounds that are affected by several things, such as speed, capacity of the waves, and the size of the waves struck. The architecture of this instrument is done by the sculptor and the Dalmatian architect Nikola Basic in 2005.